I'm NOT drinking Obama's Kool-Aid! : It's A Libtard's Paradise! A special THANK YOU! goes to my buddy, John Berg, for sharing the quote from Sheriff Arpaio. If Obama wants to go to prison, let's help him get there! He'd be busy all night long... and behind every fence post. AOW beat me to it! You got be quick, Ed... AOW's fast on this stuff! AOW and Ed beat me to it. You got to be quick, Colonel... AOW and Ed are fast on this stuff! You know none of them racist libtards will even make it to court. We need to change that! Maybe I can change it if I click the heels of my little red shoes three times, huh, Koji? I love Joe. Lived in or near his country for 20 years. He's no podunk sheriff. I'd like to think that this is B.O. 's retirement home. The clothing fits him to a tee and he might just enjoy Bubba! I never have figured out why Obamohammad has tried to stay outta prison, John... for him, it'd be better than any bathhouse he's ever known. You made it! Congratulations! ... I think? So, you've seen man's ingenuity at work. Frightening, ain't it. And these were the dumb ones who got caught. Just think of the potential out here!! Watch your back and on a happy note... Happy Note! I am anxiously awaiting your next jab on the news of Billary running for president!! 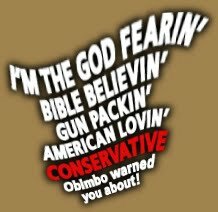 Oh, but I'm not through with Obamohammad, Koji and AOW!! So, I guess that explains why conservatives want so many of these things. ...and they look so good in pink! Obamohammad: "I Ended The War In Iraq"